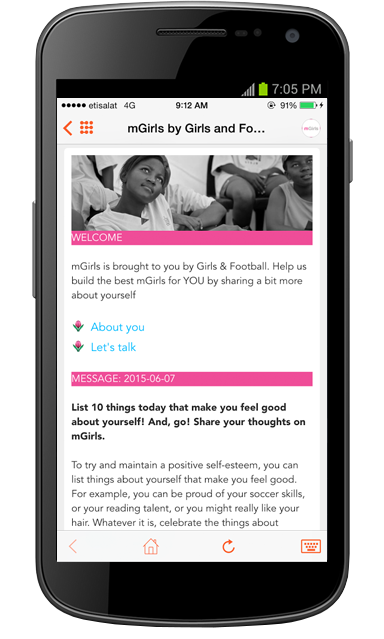 When a girl downloads the mGirls app, she has access to free, daily health information – sent straight to her phone. It’s anonymous and it’s accurate. She joins 63,000 subscribers who have been active on the app since its pilot launch in July 2014. She is able to respond to information. She can ask questions. She can learn to make better choices. mGirls offers a sustainable educational solution in communities around the world by empowering young people with health information they need. It’s open, safe and guided by other users. Each month, a report is generated that shows participation rates, subscriptions, demographics, and visitors. Content can be tailored and adapted to suit the report generated data. 50,000 reasons this year was great! In July, Girls & Football SA launced mGirls, a mobile health app which now has 50,000 subscribers. Built on the Mxit platform(available in iTunes and the Google Play Store)Â mGirls provides girls with free, daily health facts. A push text is sent to a subscriberâ€™s phone (be it a Nokia or an iPhone, the platform on which mGirls is hosted operates on 8,000 different devices) with an accurate health tip. Through effective use of technology suited to our target market, we reach girls all over South Africa. This means 50,000 girls have access to information that could change whether they know how to prevent contracting HIV/AIDS, whether they understand how sport affects their health, and whether they have the courage to actively participate in school.